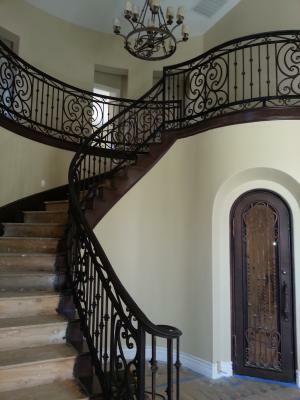 Signature Iron Doors has been the creator of the most exquisite ornamental wrought Iron work in the Phoenix Valley. Whether you live in Fountain Hills, Peoria, Paradise Valley or Scottsdale we are your source for decorative iron! Here is our most recent wrought iron railing install. We create works of art in iron whether it be iron doors, iron garage doors or iron railing. Every piece receives special attention from design to installation. Let us help you in designing, building and installing your master piece! Visit our showroom in Phoenix today or visit our website to see more and discuss with a sales representative about how to get iron railing for your home.